Stair-treads.com is the largest online provider of stair treads, stair risers, and stair parts. Offering over 38 species of domestic and exotic hardwoods, Stair-treads.com makes it easier than ever before to find an accurate match for your hardwood flooring or any other existing hardwood in your home. With a vast selection of domestic wood species including white oak, red oak, and white hard maple and hard-to-find exotic woods such as tigerwood, Brazilian cherry, and cumaru Stair-Treads.com carries the most popular wood species used by hardwood flooring companies. Samples of all our wood species are also available so you can find the best match for your flooring available, by comparing our sample to your flooring color. All the wood species are available in unfinished and natural prefinished clear selections. Our natural prefinished stair treads and stair risers are finished with a specialty aluminum oxide finish which is cured beneath powerful UV lights. Aluminum oxide is one of the longest lasting finishes available on the marked and can withstand decades of use. Stair-Treads.com also offers a selection of six stain colors available on read oak treads, risers, and stair parts. Our red oak stains are designed to match the most popular stain colors used on hardwood flooring. Finding a right match for your hardwood flooring is as easy as ordering a red oak sample pack which includes our six eloquent stain colors as well as a natural (prefinished clear) and unfinished sample. Once your sample pack arrives just simply match one of our sample swatches to your flooring. You will also receive a $20 dollar coupon through email with every sample pack order which can be applied to you next purchase. You no longer have to deal with the time consuming process of sanding, staining, and finishing your treads by hand. If you have maple flooring in your home check out our low country maple collection. Our low country maple collection offers customers four eloquent stains options on white hard maple. The low country maple collection is designed to offer bold and vibrant stain colors that will add flair and beauty to any home. 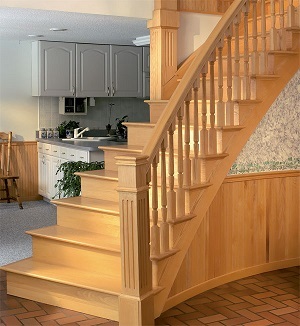 If you have a specialty stain, Stair-Treads.com also offers a custom stain program. If you do not find a wood species or stain color that matches your flooring Stair-Treads.com can custom match nearly any stain color, so you no longer have to settle for a stain color that is “close enough”. Our custom stain treads are made with the same high quality standards as all our other prefinished treads and are also finished with our durable aluminum oxide finish. Please click here for more information on our custom stain program. Contact us today if you have any questions about matching stairs for your hardwood floors. Our expert staff can help you in finding a stain color and wood species that will be the ideal match to your hardwood flooring.